I’m always on the lookout for easy summer lunches that transport well and don’t need to be heated. This salad was imagined to use up some odds and ends. I didn’t have high expectations but it came out so well, with pleasing textures and flavors. This is my first time cooking with tempeh, and I’m honestly unsure what motivated me to buy it. I had my doubts when I tried a piece raw – it tasted horrible! But marinated and fried, it adds a good flavor and some protein to the salad. Most of the other ingredients came from Rhode Island growers: the rye berries from Schartner Farms, the broccoli and garlic scapes from Pak Express. The broccoli was so good that I ate most of the bag instead of putting it in the salad…even the stems were tender. Chop the tempeh into 1/2 in cubes and marinate in a mixture of soy sauce and orange juice, just enough to cover. I used about 2 parts OJ to 1 part soy sauce. Prepare the rye berries: rinse with cool water and drain. Bring 2.5 cups water to a boil, add rye berries, turn down the heat and simmer for at least 30 minutes. If the rye berries are tender but with a bit of chewiness, they’re done. While the rye berries are cooking, chop the garlic scapes into small (1/8 in) rounds and the broccoli into 1/4 in pieces (or larger if you’d prefer). In a large bowl, prepare about a half cup of vinaigrette with some cider vinegar, olive oil, and pepper to taste. It can be a bit on the sharp/sour side because we will add some sweetness – and saltiness – later. When the rye berries are finished cooking, drain and toss with the vinaigrette, broccoli and scapes. The warm rye berries will soak up the dressing nicely. Drain the tempeh, reserving the marinade. Fry in a skillet with a bit of olive oil, browning on all sides, about 5 minutes. Pour the reserved marinade into the skillet, allowing it to cook down by about half. If you used a lot of soy sauce, you might not want to use all the marinade so your salad does not end up too salty. 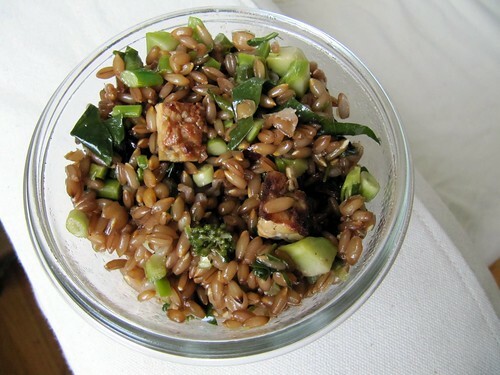 Mix the tempeh and cooked marinade into your salad, and season to taste if necessary.